Help us fund field trips! One of the key ways Indian Creek Nature Center creates Champions of Nature is through high quality environmental education. Bringing children out of the classroom and into nature through field trips not only allows them to apply the things they’re learning in school in a fun, hands-on way, but also instills in them an appreciation for the natural world. ICNC believes that early connection to nature is critical to create Champions of Nature, because young people who become passionate about nature will grow into adults who will work to protect it. To offer these high quality field trips, however, it does cost money, and Indian Creek Nature Center strives to make field trips affordable for everyone — no school is turned away. For each child attending a field trip, the participating school pays on average between $3 and $4 per child, while the true cost to the Nature Center is between $18 and $20 per child. That leaves a gap of about $15 per student to be covered by the Nature Center. Last year, 6,817 children — from preschool to 12th grade students — attended field trips at Indian Creek Nature Center. That adds up to more than $100,000 spent on high quality education, and our field trips only continue to grow. #GivingTuesday, the international day of giving following Cyber Monday (Nov. 27, 2018), is a great opportunity to support organizations and causes you care about. This year, Indian Creek Nature Center has set a goal of reaching 100 donors willing to support our mission to create Champions of Nature by offsetting the cost of our field trips. 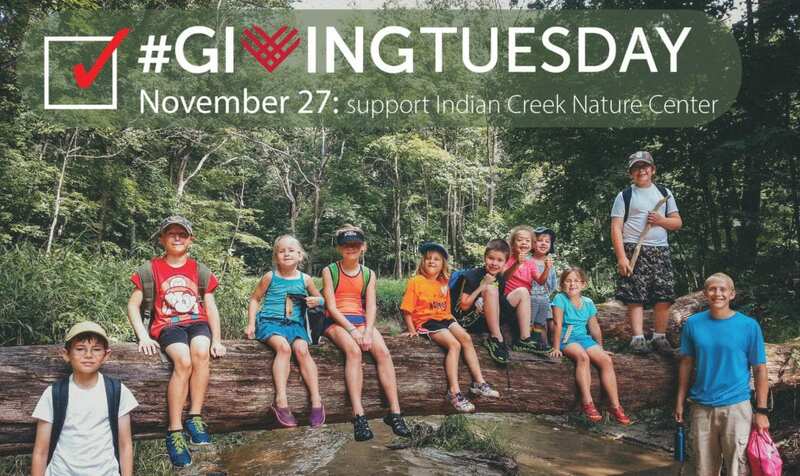 For just $15, you can directly support one child on a field trip at Indian Creek, as well as the dedicated staff and teacher-naturalist volunteers that provide the highest quality in environmental education. The more you’re able to give, the bigger impact you’ll have. For example, $450 could fund an entire class’ field trip. But, of course, we’re thrilled by donations of any size and appreciate every donor that brings us closer to our goal! To make an even bigger impact, please “like” the Nature Center on Facebook and share our #GivingTuesday posts. Tell your friends how they can help, too!